There are several types of centipedes, but the ones commonly found on properties around the metro Atlanta area are smaller, fast-moving, nocturnal pests. Few signs other than a visual spotting will confirm you have centipedes indoors. The female lays eggs in damp soil, and once hatched, the centipede grows quickly to adulthood, developing a full set of legs in the process – one set per segment. Average lifespan is approximately a year, but they have been known to live for up to six years in certain environments. They feed on small, soft bodied creatures such as spiders and worms. 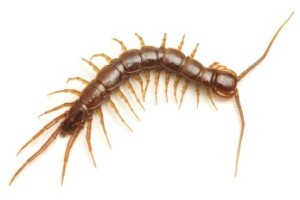 Centipedes aren’t active during the day, typically, which is why an infestation can be difficult to detect. If you see what you think is a centipede, it’s possible that a female has laid eggs nearby.